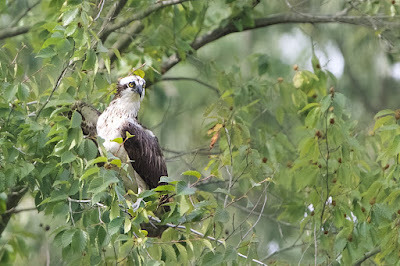 Back in the U.S.A.: Osprey at Eastern College Pond!! I couldn't believe it, but I guess I could because Eastern College Pond never ceases to amaze. Yesterday as I was looking for something to photograph, there in the sky was an Osprey!! First time ever to see one at Eastern. He circled for a bit and then landed high in a tree overlooking the pond. I waited and waited for him to descend down and pick up one of the huge carp, but he just said "Not this time."